of Aldgate East Station, 7 Days a Week. mystery in the history of crime. Our Jack the Ripper Tour is the only tour to use RIPPER-VISION, the latest hand held projectors with the latest graphic pictures some of which have never been seen before. All our guides are dedicated Ripperologists and enthusiasts, and each one is a member of the Cloak and Dagger Club, a theatrical performance team who bring old crime history to life. This is the most up to date Jack the Ripper Tour anywhere in London, the most exciting, the most shocking and a must for anyone who loves a good, gruesome mystery. So join us now as we finally track down the most elusive criminal in history - book your place today! The Whitechapel murders were committed in or near the impoverished Whitechapel District in the East End of London between 3rd April 1888 and 13th February 1891. The death of Emma Smith is the first to begin the Whitechapel murder file and a prelude to the emergence of Jack the Ripper. Hear the brutality of her murder and learn its importance. The scene that many experts claim to be the first Jack the Ripper murder, this cobbled stone laneway remains a great starting point in our tour as you can instantly feel the sense of a bygone era, of gaslit streets, dark corners and quiet footsteps in the night, as the Ripper lay in wait for his victims. Learn how the death of this one woman began the autumn of terror. One of the last sightings of victim Mary Ann Nichols before her mutilated body was discovered in Bucks Row on the night of 31st Aug 1888. This building and its surrounding area provide a great insight into the social living conditions and the everyday fight for survival in London's East End. Learn what life was really like in Victorian London. The body of Annie Chapman was discovered here in the early hours of 8th sept 1888, her throat cut across, her body horribly mutilated. What clues did the killer leave...? What does it tell us about him? See the emergence of Jack the Ripper in a series of penned letters, sent to the central news agency during the Autumn of Terror, they were written in blood red ink and sent with half a human kidney. These letters have been subject to debate ever since... Are they hoaxes? Or are they the words of the killer himself? Prepare to be transported back in time as we take you into the heart of Jack the Rippers London. Wilkes Street remains practically untouched since those cold, gaslit nights of the 19th century, the surrounding buildings will conjur up images of a bygone age... a time of darkness... a time of fear... a time of the Ripper. Elizabeth Stride's (Long Liz) body was found in Dutfield's yard off Berner Street in the early hours of 30th September 1888. Her death was only the first in a night that would forever become known as the double event. This was the night that could have revealed his identity. 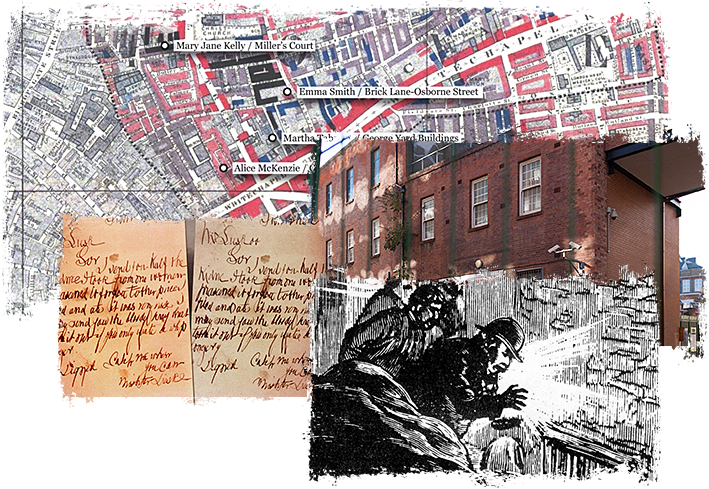 Find out how Jack the Ripper may have been caught so easily as we follow his blood trail and examine the clues. On the corner of Commercial Street and Fournier Street; in Spitalfields, stands perhaps the most famous pub in Ripper history: The Ten Bells. It is here that some, if not all, the victims frequented and perhaps even the Ripper himself. Across from the front door, a sight which would have greeted everyone associated with the Ripper case... Christ Church - this famous landmark was made famous by the movie "From Hell". The 30th September 1888 became known as the 'double event' when the Ripper killed twice in one night. We visit the original cobble-stoned square, investigate the evidence and find out how the Ripper evaded capture. Hear the shocking facts in one of the Ripper's most violent crimes. The night of the double murder left perhaps one of the most important clues in the entire case... What was it? And does it help solve the mystery? The Ripper's final victim was found in her small room of 13 Millers Court on 9th Nov 1888 and was the most savagely mutilated victim of them all. We visit the murder site and recreate the final moments of the Ripper's reign of terror. Over a century later the Police photo is very disturbing *and in the words of her Landlord, John McCarthy, "the whole scene is more than I can describe and I hope I may never see such a sight again”. Using modern criminal profiling, we reveal the man the Police should have been looking for throughout the biggest man hunt in British history. Q: When does the Jack the Ripper Tour start? A: Our tours start at 2.30pm and 7.30pm sharp, with the meeting point just outside Exit 3 of Aldgate East Station (on Whitechapel High Street) by the Whitechapel Art Gallery. Tours run every day of the week. Please arrive at the meeting point at least 10 minutes prior to departure to ensure you don’t miss the start of your tour. Q: When does the Jack the Ripper tour finish? A: Each tour lasts approximately 1 hour 45 minutes, so you can expect to finish up at around 4.15pm for the afternoon tour or 9.15pm for the evening tour. The tour finishes by Spitalfields Market and the infamous Ten Bells pub – perfect for a post-tour debrief. Q: Will the tour still run in bad weather? A: Our Jack the Ripper tour runs every day regardless of the weather so please dress accordingly with comfortable walking shoes. On occasion, it has been known to rain here in London, so remember to bring waterproofs and warmer clothes for those colder evenings. If you prefer not to participate in the tour during inclement weather, please email ahead or text us on 07803 067544 and we will happily move your tickets over to another day, subject to availability. Q: What should we do if we are running late to the Jack the Ripper tour? A: If you can, please give us a call on 07803 067544. Should you arrive at the meeting point and the tour guide isn’t there, please make your way to the first stop of the tour on Gunthorpe Street. The tour will stop here for approximately 10-15 minutes before moving on. If you are expecting to arrive later than this, simply email us and we can reschedule for another day. All tickets are valid for up to 6 months from the date of booking. Q: What area does the Jack the Ripper tour cover? A: Our tour guides will lead you around the heart of the East End, visiting the murder sites of the Ripper victims as well as other key locations from Victorian London. There will be plenty of stops along the way as we discuss the case, the crime scenes, the suspects, victims and more - but be prepared to cover some ground, too. If you have any further questions, please do not hesitate to contact us on 07803 067544, email us on info@thejacktherippertour.com or submit an enquiry form here.